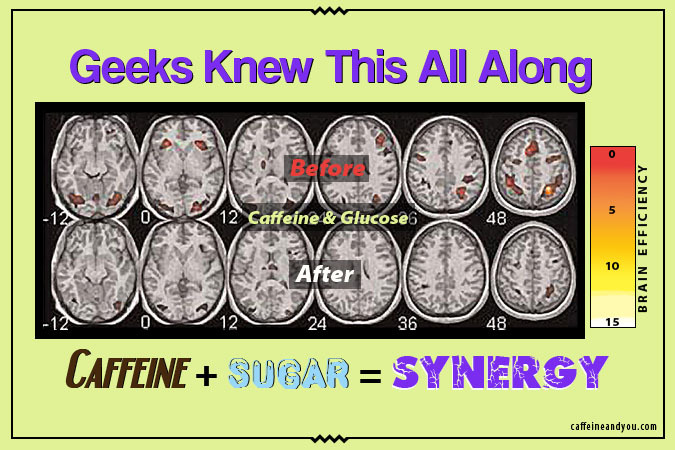 MRI: Caffeine + sugar combo = more brain efficiency (seen here as neural activity), with same productive results. Sugar + caffeine = synergy? Combo boosts memory + attention, says one study. Glucose and caffeine boost brain tasks: Sugar-sweetened coffee improves working memory and sustained attention, according to a study published in 2010 by University of Barcelona researchers. They found that glucose (in the form of sugar) and caffeine boost brain function more when taken together than they do separately. MRI brain scans measured forty test subjects under four conditions: coffee alone, coffee with sugar, sugar alone, and plain water. The subjects were asked to perform certain tasks associated with sustained attention and working memory. Individuals who consumed caffeine and glucose in combination showed no drop in their performance of the tasks, while the areas of the brain associated with these tasks showed reduced activity; in other words, the brain was more efficient. The brain on sugar and caffeine needs fewer resources to produce the same level of performance. Subjects who took only caffeine, glucose or water did not show the same efficiency in brain activity. An earlier study on caffeine and glucose taken together showed improvements in attention span and declarative memory, suggesting that a combination of caffeine and glucose may benefit attention, learning and verbal memory, none of which were observed when the substances were consumed separately. What about energy drinks? A smaller study of twenty participants measured glucose and caffeine synergy using energy drinks. Compared with a placebo, an energy drink containing caffeine, glucose, and flavored with ginseng and ginko biloba resulted in significantly improved performance on “secondary memory” and “speed of attention” tasks, but without other cognitive or mood effects. The researchers noted that glucose and caffeine taken separately would not produce the same results. They concluded there is synergy between glucose and caffeine, one that merits further investigation.